In this article, we explain how to set an NS record within the DNS settings of your domain name. NS stands for nameserver and allows you to use separate nameservers for subdomains compared to the nameservers of your root domain name. Where do I add an NS record? You can add all your DNS records easily and free of charge via your control panel. Go to the 'Domain & Hosting' tab and click the domain in the left column for which you want to set the NS record (do not check). How do I set an NS record? An NS record is used to provide a subdomain with different nameservers than the nameservers that you use for your root domain. In the example below, we want to use our own nameservers for our subdomain 'forum.site-example.com'. Name: Here we only enter the subdomain 'forum'. You do not have to enter the domain name here; our DNS software adds your domain name in the background. Type: Here we choose 'NS'. Value: Here we fill in the nameserver that we want to use for the subdomain 'forum'. In our case this is ns1.exampleserver.com. Close the value with a dot, also called the 'trailing dot'. The trailing dot ensures that our DNS software does not add your domain name after the value. After adding the NS record, you can manage the DNS for the subdomain within the configuration of the nameservers that you have entered. Please note: We do not provide technical support for the configuration of your own nameservers. If you have any questions about this, we advise you to consult the online documentation. Important: It is not necessary to add an NS record with the TransIP nameservers for subdomains. 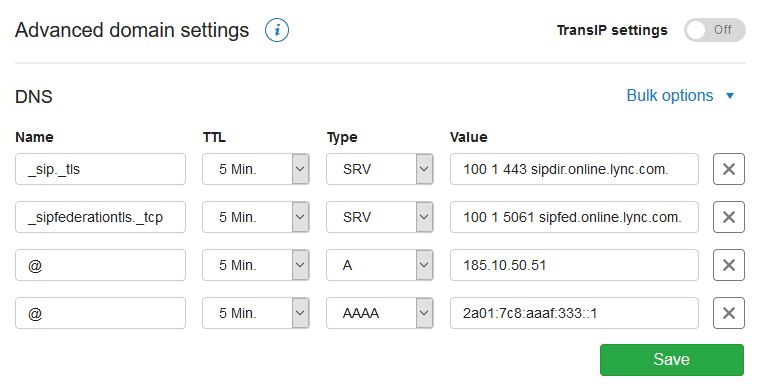 The TransIP nameservers apply to all DNS records that you set up in your control panel, with the except for subdomains that specifically use an NS record. In this article, we explained how to add an NS record for a subdomain.